A citronella spray collar provides a gentle option, especially when compared to shock collars for anti-bark training which can come with risk of high discomfort, or even pain to your dog. A spray collar, on the other hand, causes no harm to a barking dog. They’re designed to set off a gentle spray when excessive barking happens – of course, the better collars function more consistently and more accurately than low quality ones. And that’s why I’ve put this guide together: to compare and review the various spray citronella collar solutions available right now to see how they stack up (there’s actually not that many of them). After all, there’s no point having a spray collar that misfires or isn’t consistent. One of the biggest issues people face is when the spray goes off at the wrong time – this is what we want to avoid because it will likely set your training efforts back. For many people, citronella spray collars have brought much needed relief for the problem of a constantly barking dog! However, these collars are not a cure for barking. They are a tool that can be used in conjunction with other training methods in order to adapt your dog to new behaviors that don’t include excessively barking. As the Australian Veterinarian Association states, if a spray collar is to be used it should always be done so “in combination with other therapies that may address the underlying motivation for the behaviour”. This includes strategies such as regular and consistent behavior modification training. If you’ve decided that you want to try this type of collar – or are still sitting on the fence about it – below you’ll find a round up of the products available today. Based on in depth research, I present my findings of each collar, including all the pros and cons. This will hopefully help you to make an informed choice. Keep reading to find out. And at the end of this article I talk more about how these collars actually work. An automatic citronella collar is designed to work as you might guess: to activate when the dog barks. If it works well, this is obviously a good “hands off” strategy for you. As mentioned above though, if it sets off false alarms, it’s not going to be good for you or your dog. That’s why using only high quality spray collars is our only option. Auto spray collars work by detecting barking with a tiny inbuilt microphone. Obviously, they are not meant to detect or activate based on any other sounds. So the accuracy of the microphone detection system is another really important part of what separates a good collar from one that doesn’t work as accurately as you’d expect. Then there’s the option of remotely controlling the spray mechanism yourself, from a distance. This lets you activate it only when you’ve detemrined that excessive barking or other undesirable behavior is occurring, so you can get your dog’s immediate attention. As of now, there’s only one remote controllable spray collar on the market, and that’s the PetSafe Spray Commander. Read on to find out the specific details of each of the collars compared above – as well as the important advantages and potential disadvantages that people are experiencing with each one. It’s important to note that while there are other collars out there which contain a spray feature, while also including other mechanisms including often shocks or static which I never advocate. These reviews cover only those collars which are exclusively spray collars. One of the most popular and talked about spray collars. One thing is clear: it will either work for your dog or it won’t. This is not an indication of product quality, but rather compatibility with certain dogs. Comments and reviews from around the web have shown that there is a strong tendency to either give this collar a perfect rating or a negative one – at $40 odd dollars it’s a small investment that is worth the ‘risk’ of your dog not reacting to it – but when it works, it works very well. 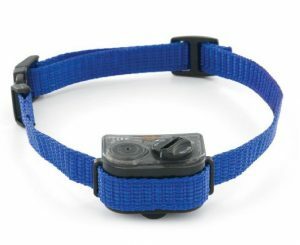 This is one of the most popular and widely bought citronella collars currently available with thousands of reviews and ratings being submitted across various retailers online. Having a problem with a barking dog is not uncommon, and for many people a low priced collar provides that afforable option for really getting the issue under control. When looking at what people are saying about this collar, a large percentage of people either had perfect success with the collar, or it did not make a difference to their dog’s behavior and they then had to try other bark control methods. This is good to know, as you will know what to expect – there’s a good chance it will work for your dog, but if it doesn’t, it is not a large financial investment in the scheme of owning a dog for a decade or more. The most positive and happy customers are adamant that this is the best anti-bark system they’ve come across. Obviously, it works very well on their dog and they have worked out exactly how to make use of a spray collar; by using it only when needed and by combining it with positive reinforcement. The life of the battery was noted to be too short for some people’s expectactions. Note that a replacement 6 volt alkaline battery costs under $4 when buying a genuine battery, or even less if you purchase generic. Unfortunately many people do not understand that a spray collar is not a permanent barking solution. Instead, it should be used only some of the time, and certainly not kept on the dog permanently. This could be why their batteries ran out so soon due to over-use. This was commonly brought up by people who both may or may not have been seeing good results. It is possible that those people bought the collar when it was higher priced. but it is now selling at less around half of the previous cost, so this is a moot point. The cost of any of the collars on this page is considered low when you think about the lifetime cost of having a dog and all the other related expenses in comparison. Some people have noted that their dog has “saggy neck skin” and the collar thus didn’t sit properly. It may well be that this is true for those breeds who have excessive neck skin (for example, dogs such as the Shar-Pei would fit here). Petsafe brand unscented spray can refills can be purchased here and can provide up to 400 refills per can (remember, each cartridge in the collar stores up to 30 sprays, so one can of spray refill will last a long time). Overall the PetSafe Gentle Spray Bark Collar is the most popular citronella spray bark control collar currently available and is at the top of the list for people wanting to give this gentle, humane and safe method of excessive bark control a go. The Elite collar from Petsafe comes in two versions: Big Dog and Little Dog. Both versions are adjustable so you can get a secure fit. For small dog breeds, it fits to a neck size up to 20″. 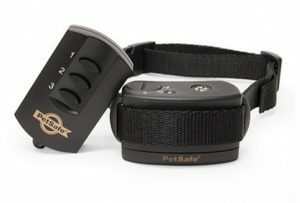 While the PetSafe Elite Big Dog Spray Bark Control Collar fits large dogs with necks up to 28″. The suitable weight range however is quite wide, as the collar is fine for dogs anywhere between 8 and 55 lbs. It is the neck size that you should pay most attention to however when you are determining whether your dog is small enough for this collar. This collar is ideal for most Terrier dogs, who are of course known to often be serial barkers. 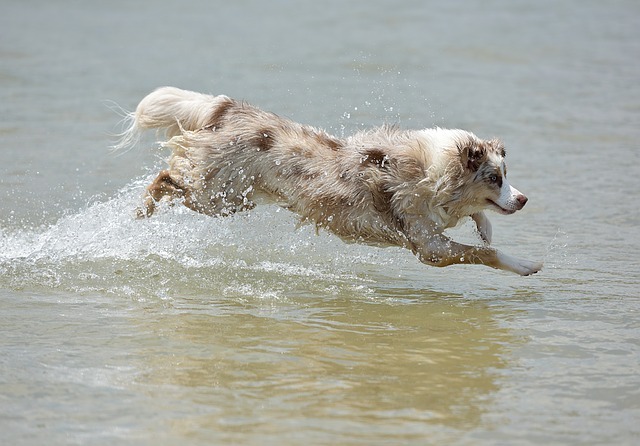 Unlike some other collars, this one is waterproof in up to 5 feet of water, so your dog can even wear it when splashing about. It is a very simple, lightweight collar that works by using both sound and vibration sensors to detect a bark; this means barks from surrounding dogs do not mistakenly activate the collar which is a common problem in some other spray collars. This collar costs a little more than the PetSafe Gentle, however the waterproofing alone is enough to justify the slightly larger investment for many people. Waterproof: Yes and can be submerged in water up to 5 feet deep. The Spray Commander from Petsafe is the only manual control spray collar in this line up – all the others activate automatically when barking is detected. The Spray Commander obviously allows you to take a much more proactive approach in how you use the collar, and this is why it’s such a popular option. This is a more advanced and sophisticated collar that is not just designed for bark control, but for other types of training and behavioral adjustment as well thanks to the way you control it remotely to get your dog’s immediate attention. However even if your only issue is excessive barking, this collar is about as good as it gets. Yes, it costs a little more than the other spray collars above, however it is a very popular choice with positive results being shared by users. This spray collar suits almost all dogs as far as size goes, from small to large breeds. The maximum neck width it will fit is 24″ and it will comfortably fit anything below that. It is not recommended for dogs weighing under 6lbs as the device might be too heavy to be worn comfortably on the smallest dogs. However for the majority of dogs, the lightweight receiver on the Dogtek collar should be worn without any issues. The collar itself is a simple nylon strap which you adjust to fit your dog. Getting a good fit is important so the spray is aimed at the right area, and so your dog is comfortable while wearing the collar. it’s no different to adjusting a normal dog collar, so this is a quick process. This collar works by detecting the sound of the dog’s bark with a small microphone receiver, instantly instructing the collar to emit a quick spray to jolt your dog out of the barking behavior. Once you’ve got the collar on properly, the spray will be aimed at the lower jaw area of the dog and it emits in a brief mist, rather than a sharp squirt. So it’s gentle but still powerful and startling enough to immediately distract the dog from what you don’t want him or her to be doing (barking excessively). The spray used in this collar is specific to this brand, and they call it the No Bark Spray. However, it is still a regular citronella spray. Dogtek just wants to make sure that (understandably) you buy their spray refills. With that said, will the Petsafe refills work with your Dogtek collar? Yes they do and some people do choose to buy another brand of refill (based on convenience or price usually). DogTek also notes that their refills work fine with PetSafe and other no bark spray collars, so you can mix and match without worry. You receive one canister of the spray in the box, and refills are available from DogTek after that one is used up. Each receiver and spray storage unitu on the collar is good for about 20 bursts of spray. This doesn’t sound like much, but keep in mind it’s not something you should be using continuously because the goal is to get your dog used to the unwanted effect of barking (being sprayed), and so the collar is used sparingly and as needed rather than being constantly worn. The refill canisters that you purchase hold enough for 300-400 sprays, so you’re able to fill up the collar multiple times with the one can. Obviously, you can expect to use more spray in the beginning stages of this training so your mileage will vary as far as how long a refill will last for you. For most dogs and in most cases, this will be several months worth or more. There’s an on/off switch on the front of the unit, so you can easily deactivate the collar even while your dog is still wearing it. The Dogtek collar comes with a 1 year warranty. It runs on a regular 6v alkaline battery which are easily and cheaply replaced when needed, but they do not run out quickly in this low powered device. Besides talking about specific products, I also want to talk about citronella spray collars more generally. How do they work and do they actually work to reduce or even completely eliminate problematic barking in a dog? Spray collars for bark control make use of citronella, a harmless essential oil, as a gentle deterrent to curb a dog’s unwanted and excessive barking behavior. Collars will use either sound or vibration, or sometimes both, to detect a bark and immediately emit a gentle burst spray of citronella to the dog’s snout. The goal of the spray is to bring about an immediate distraction to the dog, so he halts the barking. This allows a fast redirection of his attention and makes him forget what he was barking at. It also allows the opportunity for you to gain your dog’s immediate attention, where he may have ignored you completely while he was barking. Most collars will provide between 30 and 50 sprays per refill, and you purchase refills in spray cans to top up the collar when it’s empty. Unlike electric shock collars, citronella spray collars are a harmless and humane method of reducing and controlling excessive barking in your dog. the petsafe gentle spray collar is $55. the elite small collar is $70. i call that expensive. i purchased the small dog collar, maybe 3 years ago, when it was $55. i find a $15 hike within 3 years high. Will this collar work with Shetland Sheepdogs since they have so much fur? Thanks. Are there any citronella collars that work to automatically detect barking AND offer remote training ability? The standard collar/neck size measurements for great danes is around 22-24″ for females and up to 26 inches for male dogs. The Petsafe collar above can fit dogs up to 28″ neck size. Let us know how you go if you try this or any other spray collar. Have these collars been effective for large dogs? I have. 140 lb. Great Dane.